A quick lunch recipe I prepared a few weeks ago. Nothing was going on, we were just too bored to cook up a full meal. I was having wonderful conversation with my brother and father-in-law. I thought of cooking a simple pasta, and prepared penne with fennel and red chilli powder, to make it a little bit spicy. Here is the recipe. Cut the fennel root into inch long slices, avoiding the center as it contains the stem. Set aside. 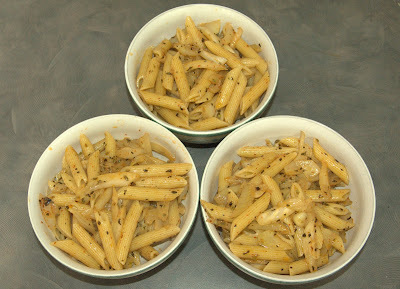 To add more fennel flavor that gives a very fresh and different taste to the pasta, crush 1 tsp of fennel seeds. You can usually buy fennel seeds in any grocery store, if not get it at any Indian grocery store. For the pasta, I think around 2 cups of uncooked penne should give you 3 cups of cooked penne. Cook the raw pasta in boiling water with some salt for roughly 10 - 15 minutes for ready to eat penne, or cook longer to your liking. Like always, taste the pasta to see if its cooked well enough to your liking. As the pasta is getting cooked, on a medium hot pan add 2 tbsp extra virgin olive oil and just as the oil is getting hot add the crushed fennel seeds, dried basil leaves, and the red chilli powder. Immediately after this add the cut fennel root, salt and a little pepper taste and saute all the ingredients together. Cook the fennel until it is cooked but still crunchy, to the point where the root still has its raw freshness and sweetness, but is cooked. Add the cooked penne at this time, 1/2 tbsp of extra virgin olive oil and mix everything together well. Serve hot. This is a refreshingly different tasting meal especially due to the presence of the fennel seeds, and you will love it. Ingredient Substitute/s: If you live in an area where you don't get fennel root, you can replace the fennel with large white onions (the sweeter and less pungent kind) and repeat the above process.